Welcome to Solaris Yachts UK, a joint venture between Richard Baldwin and Berthon International. Richard has been selling Solaris Yachts for over 8 years and he and Berthon have worked together for many years in the general yacht market. Solaris Yachts started building yachts in 1974 and the yard has a great history of constructing and refitting custom yachts. Today Solaris build a world class range of performance cruising yachts from 37 feet to 60 feet, all of which are designed by Soto Acebal. 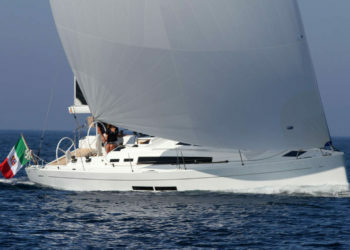 In addition to their high quality class yachts, they also have an active custom division. With their distinctive Italian good looks, sparkling sailing and light, airy interiors, they offer fun and exhilarating family yachting with easy, comfortable living too. They can achieve fast passage times without the need for large crews and are the prettiest yachts in any anchorage. An important Solaris trademark is the 40mm main bulkhead which is fully laminated to both the hull and the deck as are all partial bulkheads and joinery. This provides a strong and stable structure. The craftsmen at Solaris adopt a thoughtful approach to all aspects of the yachts’ build, from keel attachment to chain plates to the faultless interior joinery. The quality of build is evident throughout. The Solaris 37 is equipped with all the good looks, performance and high quality fit out that is found aboard her larger sisters, this pocket Solaris is a very big, little yacht. On deck her outboard chain plates and under deck halyards emphasize her clean lines. Set up to be easily sailed by a couple, she will also shine on the regatta circuit if optimised. The new Solaris 44 sets a new standard in the performance cruising sector. For the first time, a yacht of this size has four winches positioned aft, close to the helmsman, to control all the below-deck lines and enable safe short-handed sailing. The Soto design continues the consistent theme of the range, with a fast, stable and forgiving hull shape sporting a dreadnought bow for maximum water line length and a broad, chined stern to reduce drag and increase stability. Another new feature is the twin rudders which provide excellent directional stability, especially in heavy conditions. The hull design also provides for a roomy and light interior with three double cabins and one bathroom as standard, and an optional second bathroom forward. The Solaris 47, with her high performance hull shape, that performs beautifully even in adverse weather conditions, has a high stability coefficient enabling her to maintain sail area in significant breeze. She is a development of the Solaris 50 and 58 and like her sisters she can be comfortably sailed by a couple whilst occupying a racing role when required. She has a spacious dinghy garage and below are found 3 cabins and 2 heads compartments. The ergonomics of the interior have been carefully considered in arriving at the finished design. Developed from the Solaris 48, which was a benchmark yacht introduced to the market in 2006, a range of evolutionary new ideas have been incorporated into the Solaris 50. She is equipped with 4 winches at the twin wheels and all lines are led here to give total control of the sailing function. 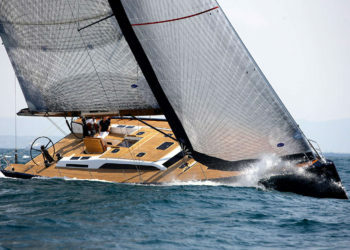 A self-tacking jib, foldaway sprayhood and integrated bowsprit add to the sailing experience. She has a large sail locker which can accommodate a crew berth if needed. She lends herself to fast, safe short-handed cruising. The Solaris 55 was the result of a 14 month collaboration with Soto Acebal and the Solaris team, it was important to achieve a marriage of performance, aesthetics and functionality. She carries her maximum beam after, and a high stability ratio and righting moment is a feature of her design, which go together with a t-keel, with lead bulb, which has a stability ratio of over 40%. She is easily handled by small crews. All sleeping cabins have en-suite heads and the forward lazarette can easily be altered to become a crew quarter. The Solaris 58 is a proper cruiser racer. She is fast and powerful in heavy seas. Attention has been paid to the correct distribution of all variable weight to ensure that it remains amidships in order to retain the correct trim of the yacht. She has a modern reverse bow for improved wave penetration. The interior can be specified to the yacht's new owner's wish. The tender garage has longitudinal access so the dinghy and outboard can remain together for launch the retrieval which is accomplished using a capstan winch.